I have never experienced such an interesting wine tasting as the one I’m going to feature in this blog post. For a few years now, we have worked with HALL Wines and attended their events at the winery such as the Annual Cabernet Cookoff Fundraiser and the Kathryn Hall Cabernet Release Parties. 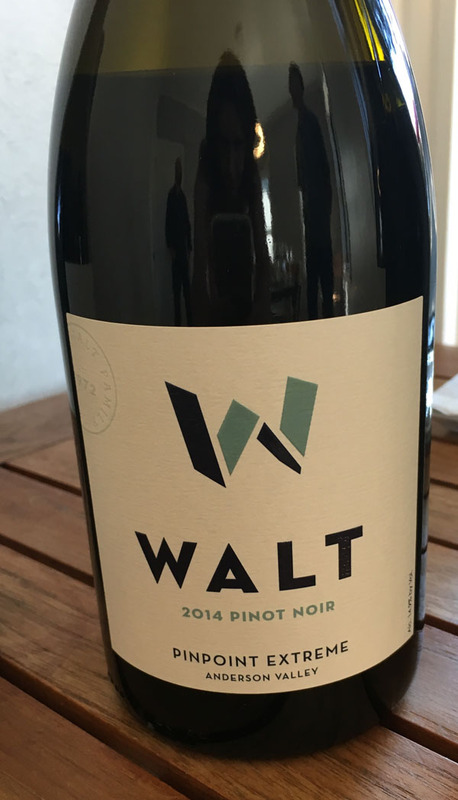 We were first introduced to WALT Wines at one of the HALL events (Walt is owned by Vintners Kathryn Walt Hall and Craig Hall), and WALT was also at the Pinot on the River event we attended 2 years ago in Healdsburg. 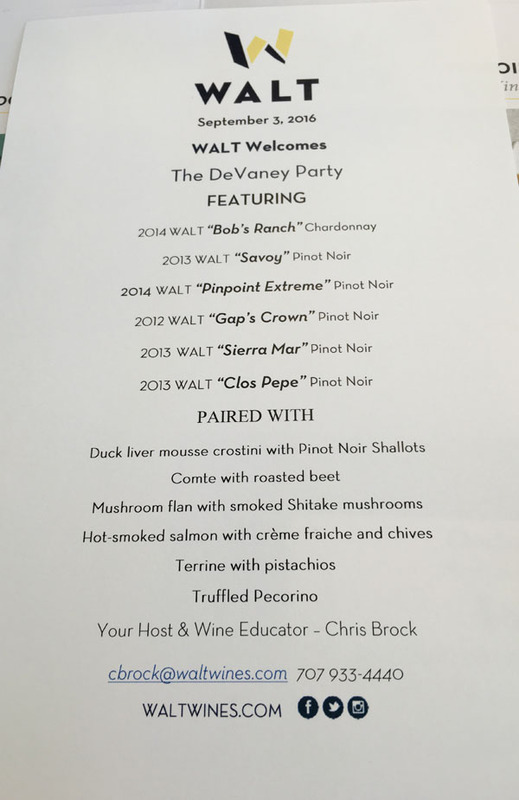 Since then, both WALT Chardonnay and Pinot Noir have been on my list of wines I would recommend if you are a fan of either varietal, but I never got a chance to visit the tasting room or learn more about the wines they make until a few weekends ago when Andy and I were invited to participate in a new food and wine pairing/tasting called Root 101. Root 101 examines one Chardonnay and five Pinot Noirs by appellation (geographical region where the grapes were grown). These different appellations can inflect various characteristics in the wine, even though it is the same varietal. 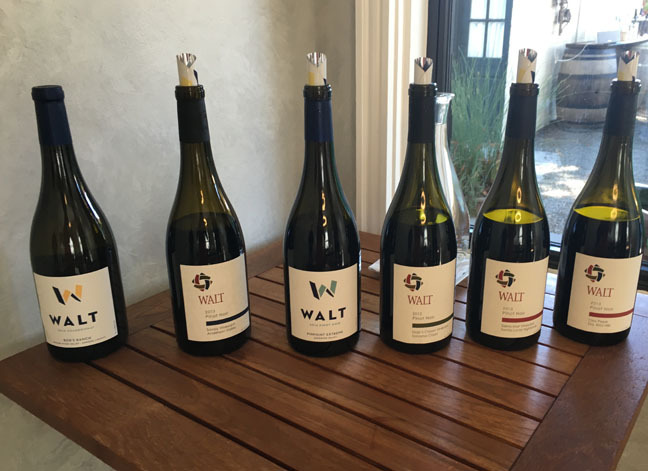 Even though the Root 101 tasting focuses on one Chardonnay and five Pinot Noirs, it should be noted that WALT actually makes 12 different Pinot Noirs, 3 Chardonnays, and 1 Rosé of Pinot Noir and sources their grapes from the Sonoma Coast, Los Carneros, Sta. Rita Hills, Santa Lucia Highlands, Anderson Valley, and Willamette Valley appellations. Our tasting was led by Chris Brock, a truly knowledgeable host and wine educator. 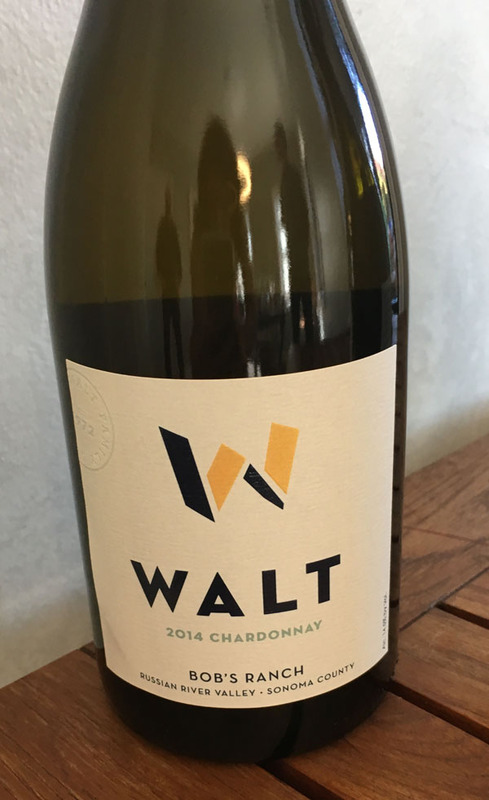 Before coming to work in the WALT tasting room, he had served a number of years as a sommelier. We were lucky to have him to ourselves, because that would allow Andy and I to get super wine nerdy without boring other guests. First Chris would introduce the food pairings and tell us we were free to nibble on the food and taste the wines throughout his commentary. 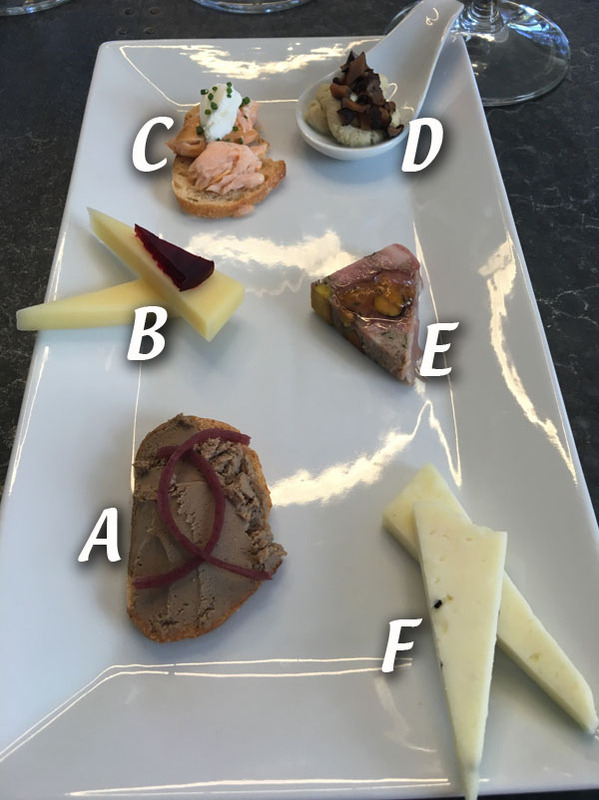 Now that we were familiar with what we would be eating (and warned to avoid the truffled pecorino until the end because of its very strong presence on the palate), we were ready to taste and learn about the wines. First up was the sole Chardonnay of the Root 101 tasting. The Bob’s Ranch Chardonnay, Russian River Valley, Sonoma County. It is luscious and full and it is the most expensive of the three Chardonnays available at WALT. The richness of the wine no doubt comes from the sandy and well draining soils that impart stress on the vines. It has just the right balance of oak and fruit. At the tasting I was thrown off a little because this Chardonnay almost stole the show (we were at a primarily Pinot Noir tasting of course) with its floral and fruit and soft vanilla (still a powerful wine) without being all heavy butter and oak. The First Pinot Noir of the tasting was the Savoy Vineyard Pinot Noir sourced from Anderson Valley. The Savoy was something I would describe as Burgundian––less fruit and more earth and mineral notes present in the wine. 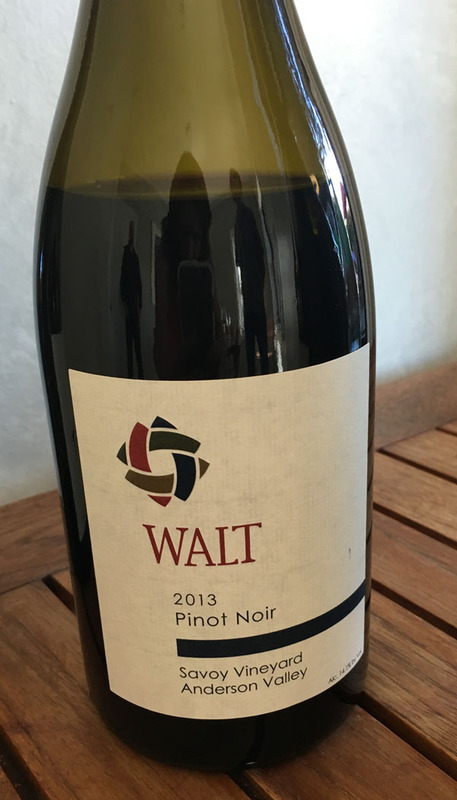 The Savoy Vineyard is the northernmost vineyard in California from which WALT sources their Pinot, however, there is also the even further north Shea Vineyard in the Willamette Valley (Oregon), where WALT sources grapes for another Pinot which we did not taste that day. 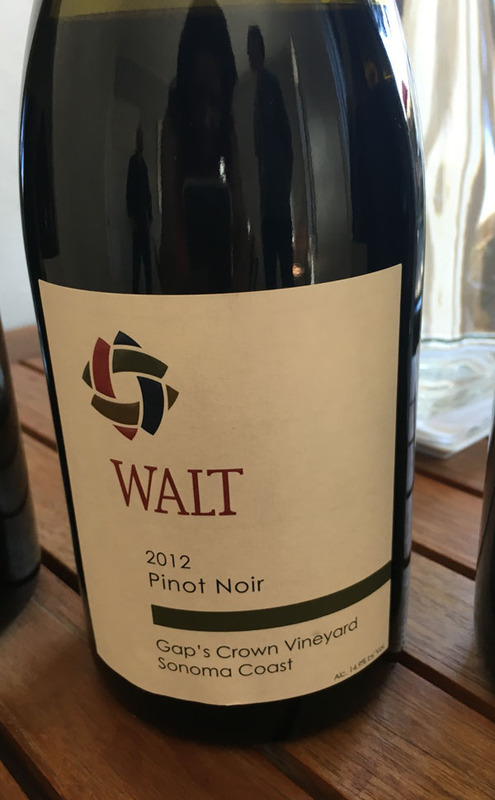 I appreciated the omission, because it seemed more appropriate to taste just WALT‘s Pinot Noirs sourced from California and juxtapose their terroirs to examine how vast their differences can be. The second Pinot Noir we tried was the Pinpoint Extreme, also sourced from Alexander Valley, but from The Corners Vineyard. Interestingly, the letters in Pinpoint Extreme can be reorganized to form the words “Pinot Experiment”. A fitting name because this Pinot Noir is a wine that is a deliberate nod to cutting edge winemaking. It is non-formuliac and is guaranteed to be different from vintage to vintage. And speaking of cutting edge, I wanted to mention the fantastic rebranding I have seen at Walt Wines. I asked about the logo change and our host Chris explaned that the older logos were similar to HALL Wines in color and at first WALT was sort of housed under the HALL label. More recently, WALT has established a name of its own, and therefore the new logo. The logo is a two-colored “W” with the mainly color being a dark blue, and features a different highlight color from bottle to bottle. The highlight color is actually color coded to reflect each vineyard from which the grapes were sourced. For instance, the Shea Vineyard, Willamette Valley has an olive green highlight. The Anderson Valley wines have a light blue highlight on their “W”. Wines from the Sonoma County Vineyards are highlighted in yellow. Carneros has an orange highlight, and the Central Coast wines have a “W” highlighted in red. I have been in graphic design for over 15 years, and I am in love with this style of branding, so if I am getting off track in describing the wines, I apologize. I just really like the color coding and think it’s a great learning tool in identifying the differences in appellations. Moving on, our next wine to taste was my favorite of all, the Gap’s Crown, from Sonoma Coast. The Gap’s Crown had all my favorite characteristics. Medium to high acidity, jammy, ruby fruit and a tad bit of forest floor. Most of the acidity and fruit-forwardness in the wine comes from the vineyard being stressed during its growth. The fog and strong winds and intermittent bright afternoon sunshine are typical for this part of Sonoma County and the Petaluma Gap, and almost always (in my opinion) make for a Pinot Noir packed with personality. for an area with an extreme mountain coastal terroir. 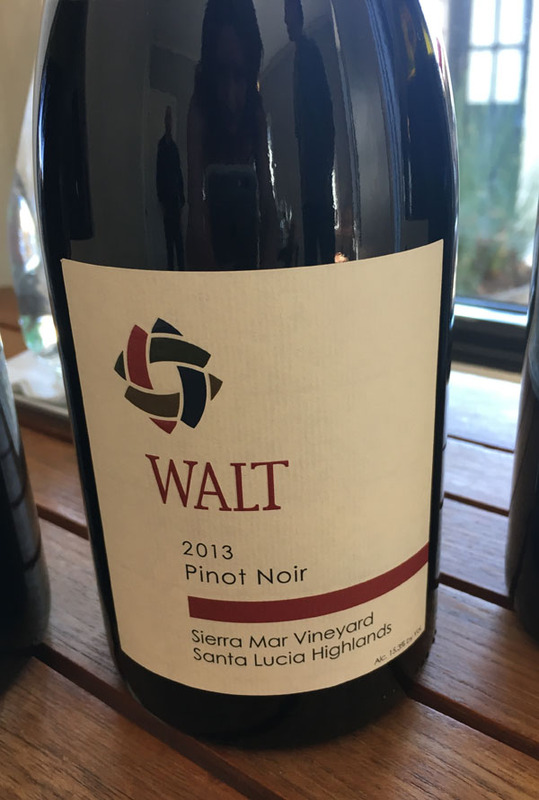 The Walt Sierra Mar has more of a smoky presence which most likely originates from the granite and gravely soils the vines grow in. The smoke characteristic along with acidity is Andy’s favorite in a Pinot Noir, and it lends itself to be a very good food pairing wine, especially with foods that also smell/taste earthy. I’m talking about beets, mushrooms, and even salmon, for it has the presence of the sea that pairs with the slight salinity in the wine. We ended up buying a three year vertical of the Sierra Mar, as Chris was gracious to allow us to sample the newest release and included a previous release. I am already looking forward to opening them all at a time, along with enjoying a meal I have created specifically to pair with the wines. 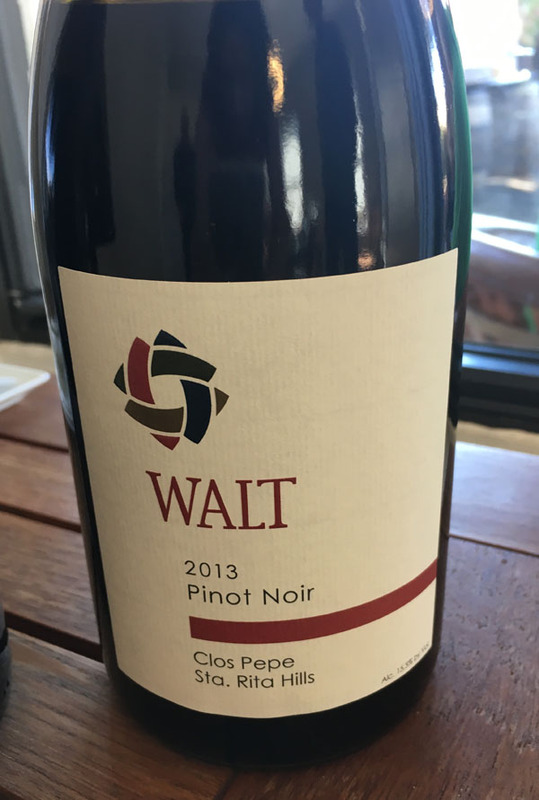 We ended our tasting with the WALT Clos Pepe Pinot Noir, sourced from Clos Pepe, a 29-acre vineyard in the Santa Rita Hills near Santa Barbara, because it had the most heft. These are the kinds of Pinot Noirs that are pairable with even richer foods, such as the truffled pecorino we had on our appetizer plate. I would call the Clos Pepe slighly brooding, yet refined. There’s full fruit and minerality present like in the wines before it, it’s just a little more melodramatic. Andy and I both truly savored this opportunity to try so many of the Pinot Noirs in WALT‘s library. The Chardonnay was definitely the icing on the cake and we definitely purchased a few bottles of that, too. Since place is so important in the outcome of a wine (the point of the tasting), here’s an appellation map so you can see the areas I have discussed where Walt sources their grapes. About the winemaker: Megan Gunderson Paredes is the winemaker at both WALT and HALL wines. Megan possesses degrees in both Biochemistry and Molecular Genetics, and the knowledge of these subjects lend themselves to the scientific aspects of winemaking. 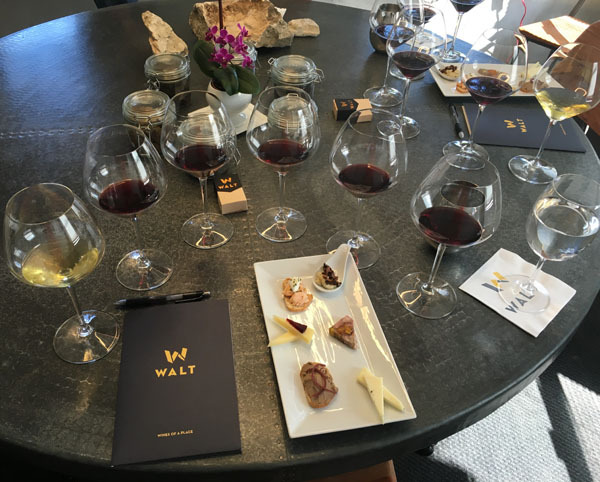 The WALT Tasting Room in Sonoma is open to the public for daily wine tastings from 11 am to 5:30 pm for reservations and information go to WALTWines.com/join-us. Root 101 is offered daily at 11am & 2pm. The Experience is by reservation only and lasts approximately 60 minutes. It is $60 per person and $40 per person for wine club members. To reserve the Root 101 experience, please call Thrace at (707) 933-4440 ext 3102 or email tbromberger(at)waltwines.com. You can also specifically book a Root 101 tasting by clicking here. 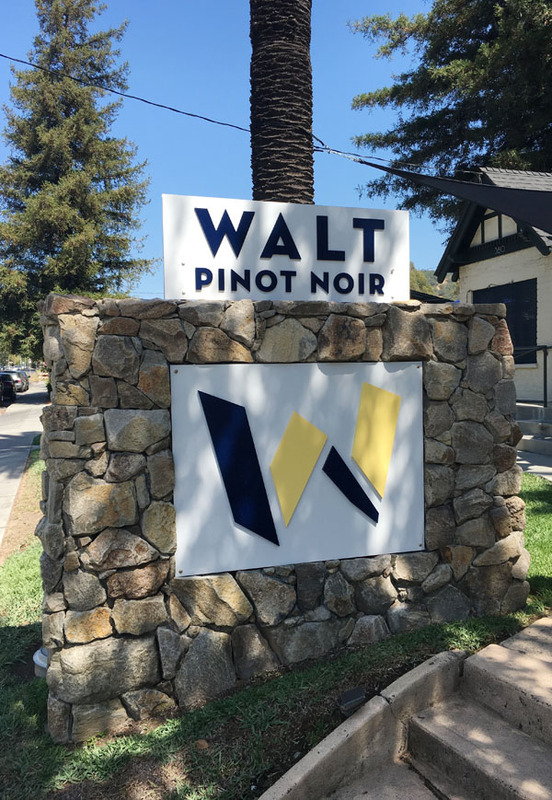 You can use the hashtag #pinotland to tag WALT via social media. You can find Walt Wines on Facebook here and follow them on Twitter here. They are also on Instagram here. This entry was posted on September 13, 2016 by cavegrrl. It was filed under Uncategorized and was tagged with ANDERSON VALLEY, appellation, CENTRAL COAST, chardonnay, Hall wines, LOS CARNEROS, pinot noir, pinotland, Root 101, soil, SONOMA COAST, the girl and the fig, WALT wines, WILLAMETTE VALLEY.